At Natural health Chiropractic, we use an adjusting style commonly referred to as “Diversified.” First, an analysis of your spine is performed. This can initially involve a case history and X-ray pictures of your spine. SOT stands for Sacro Occipital Technique, a chiropractic technique designed to help normalise the relationship between the pelvis and the head. The Foundation – The integrity of the spine, and the function of the nervous system it protects, begins with the pelvis. This foundation is constantly subjected to the pull of gravity. When stability is lost, it produces effects throughout your body. The Cranium – Proper control of every cell and tissue of your body is affected by bones of the skull and tension on your spinal cord. Think of your spinal cord as a string on a harp. Is it flexible and healthy? Or stretched and drawn tight? Blocking the Spine – We use wedge-shaped devices known as “blocks” to help correct your spine and properly “tune” your nervous system. By knowing exactly where to position these blocks, we use the weight of your body to make corrections, naturally. Safe and Comfortable – By using gravity and your own body to effect correction, new healthier patterns of spinal function can result. Along with safe, consistent results, SOT is known for emphasising patient comfort. A System of Analysis – Early chiropractors noticed that vertebral subluxation complexes would produce the appearance of a short, or contracted leg. Using a protocol of comparing leg lengths while the patient turned their head, helped determine whether the subluxation was in the upper, middle or lower back. Terminal Point Table – What patients often notice first is our segmental “drop” table. Individual cushions or “drop pieces” located along our table surface, support each area of your spine until the thrust is delivered. Then, each drop-piece gently gives way, reducing the amount of energy needed to move a specific spinal segment. Popular and Patented – So unique is this approach, Dr. Thompson was granted a patent in 1955. Since then, because of its precision and patient results, it is a technique used around the world. 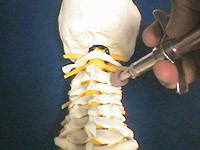 Activator technique utilizes a small spring-loaded adjusting instrument to deliver a focused corrective impulse into the dysfunctional spinal segment. This technique is most commonly used in patients who prefer a low-force correction. When any force, such as a chiropractic adjustment, intrudes into the body, muscles in the involved area are automatically contracted by reflex mechanism, in order to protect that area from the intrusion. The Activator instrument produces a thrust which is quicker than the body’s reflexes can respond and tighten up the local muscles. In other words, the thrust delivered by the instrument is so quick that it accelerates ahead of the body’s tendency to tighten up and resist the thrust of an adjustment. So, in simple terms, the force necessary to move and adjust the joint is developed by the “speed” of the instrument’s thrust, and not by a high “force”. So, although the Activator instrument produces a very effective thrust, it is felt as a very gentle sensation only. For great health, our bodies require a nervous system that’s functioning at its best. The nervous system acts as a communication device between parts of the body, but physical or psychological stresses caused by general day-to-day activity make it prone to dysfunction. When that occurs, and communication between areas of the body is prevented, we experience discomfort, pain, and other distressing health issues.